Ok, I’ll admit it. I’m having a case of Craft Envy. Where ever I look, people are making some amazing things. Jen (of Cake Wrecks and Epbot fame) made a steampunk White Rabbit costume as a follow-up to her steampunk Lady Darth Vader costume (Lady Vadore). Pinterest is filled with crafters posting their handiwork. Even in my own house I can’t escape the crafting. B seems to be perpetually knitting or crocheting some new, cool project. A little while after I got a sonic screwdriver for my birthday, I began thinking about Halloween. Usually, I don’t think that far in advance. I tend to consider the holiday about a week before the actual day. Which, if I want a costume, leads to a hurried rush through stores or a raiding of my old costumes. This time, though, I began to wonder if I could pull off a Matt Smith’s Doctor costume. Side Note: David Tennant is my favorite Doctor, but I thought that Matt Smith’s look was a bit more iconic and easier to pull off… especially since I already had his sonic screwdriver. Matt Smith’s Doctor basically needs: A pair of black pants, a brown tweed-ish jacket, a light colored (perhaps cream or blue) shirt, burgundy suspenders, a red bow tie (bow ties are cool) and a fez (also cool). Looking through my clothes, I found a jacket that would work as well as pants and a shirt. That just left the suspenders, bow tie and fez. Now we get to the quandary. There’s an official Doctor Who bow tie/fez set that can be purchased online and in a few brick-and-mortar stores. I also hunted down a few locations online that offer suspenders of the kind I need. So I could easily buy the remainder of my costume and be all set. But part of me really wants to MAKE some or all of the rest. However, then there’s the big yellow hat lingering in the room. A few years back, I got the urge to be crafty and made a “Man In The Yellow Hat” costume to go with my son’s Monkey costume. I bought a cheap foam hat, glued on foam balls to increase the height, and then glued on yellow felt to make it all the right color. It came out spectacular. By which, I mean it stunk. Bad. I still have it, but it is hidden in a closet upstairs. If I go the crafting route, I risk spending $20 and having another yellow hat incident. True, this time I’d have guidance and wouldn’t be simply making it up as I go along. However, there’s still plenty of steps that I could mess up. Perhaps I’d cut out the pattern wrong. Maybe my stitching wouldn’t be up to par. My gluing might leave globs of glue visible. The yellow hat might wind up with a decidedly UNCOOL bow tie/fez/suspenders to keep it company. Worse still, I might fail and leave myself no time to buy a professionally made bow tie, fez, and suspenders thus ruining any chance my Doctor costume has to see the light of day. I’m not sure what I’ll wind up doing. Maybe I’ll tackle one of the items (perhaps the fez) and buy the others elsewhere. Maybe I’ll buy the fez/bow tie set from a store near me as a backup plan while I attempt the crafting route. (I can return the purchased items if the craft is a success.) All I know is that I’m getting the itch to craft! Would you buy already-made items from the store or take the crafting route? 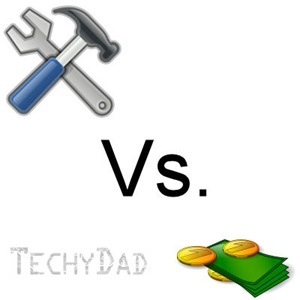 NOTE: The “build vs buy” image above was composed of “Tools, Hammer, Spanner” by Andy and “Money – banknotes and coin” by n_kamil. Both images are available through OpenClipArt.org.